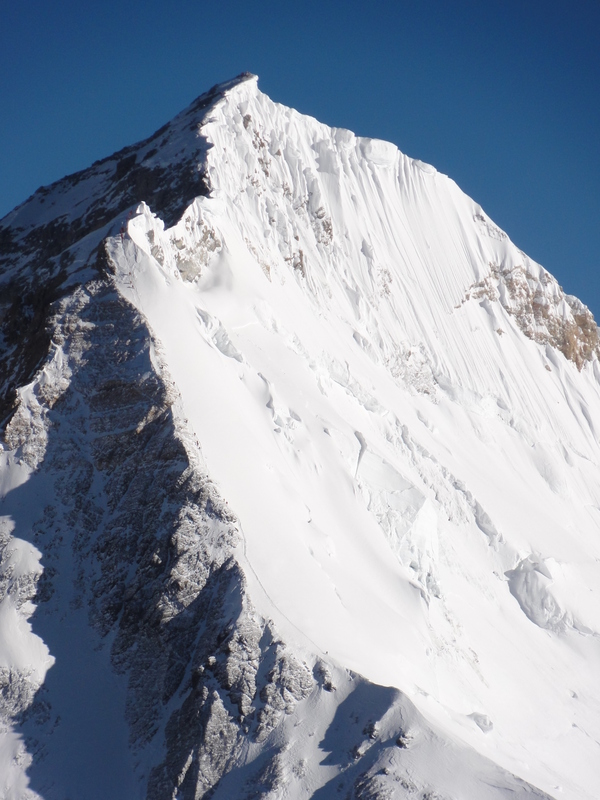 The route I took from the Balcony to the summit as seen from Lhotse on the same day I summited. I stood on the summit of Mount Everest at 5:00 AM, malady May 21, 2011. To say this event had a personal meaning is an understatement. To say it had a broader meaning leaves much to be explained. I will write a complete trip report in my usual standard once I get home but for now here is an overview from my summit push. The weather played havoc with every team in 2011. High winds were forecasted and changed plans but then never materialized. Sudden storms did appear without notice causing great discomfort, > concern and in some cases, frostbite and blindness. So when our IMG expedition leader announced at 9:00 PM May 15, the weather forecast had changed for the positive and we needed to leave base camp in 5 hours, we were skeptical to say the least. But we moved ahead spending a night a Camp 1 and then moved to Camp 2. But the forecast changed yet again, this time calling for high winds the morning, May 19, we were supposed to summit. While other teams ignored this revision, we stood down and spent another night at Camp 2. Not all bad since this gave our bodies more time to rest, hydrate and prepare for our ultimate summit push. But now our summit was at the end of a 3 day window of low winds so the margin for error was reduced to zero – assuming the forecast were valid. But we moved forward and on to Camp 3, then to the South Col, a harsh camp at nearly 8000m where the body no longer functions properly. My climb from C3 to the Col was fast, over twice as fast as my previous climb; about 3 hours. The recent snows had made the route over the Yellow Band, a limestone strata that crosses the Himalaya in the area, and on the Geneva Spur slightly easier instead of climb on rock. Arriving at the South Col is more like landing on a distance planet. The ground is covered with small slate tablets revealing a history of being underwater at some point – amazing. But the overriding feature is the route up the Triangular Face to the Balcony. From there the route follows the Southeast ridge to the South Summit. You cannot see the true summit of Everest from the South Col – but you know it is there. As we settled into our tents at 9:00 AM, we knew we would leave about 12 hours later – weather depending. Then the call came; the winds which had been forecasted to be calm, were now called to pick up in the afternoon and then die down in the night; when we were climbing. But more unsettling were that extremely high winds were called for the next day – after our summit. The tension mounted as our window became much shorter. On schedule, the winds started up Friday afternoon. We heard of over 100 summits that same morning with perfect conditions. I was tenting with Mirjam and we just lay in our sleeping bags trying to sleep. My overriding thoughts were of the winds and if they did not stop. IMG was not set up for us to stay at the Col for another day. After 2 months of preparation, it could all come to an end. But as the sun set, the winds seem to start to calm. At this point there were less than 30 people at the South Col meaning crowds would not be a huge issue. We set a departure time of 9:00 PM. My personal thought was it would take me between 12 to 14 hours to reach the summit, at my pace, putting me there at mid morning on May 21. I lay in my tent, my stomach churned; I was getting more and more nervous with each passing gust. The summit meant a lot to me given I had tried three times. Cathy, my wife, and I had made climbing a priority for our family and I found great satisfaction from the expedition life to meeting fellow climbers to actually climbing; yet Everest remained a goal seemingly far out of my skills and ability. I had climb just below the Balcony in each previous attempt turning back due to not being strong enough either physically or mentally. But Alzheimer’s changed my life forever. As my mom spent 8 difficult years with disease, I saw the lack of knowledge in the public, the lack of funding for research, the lack of tools to the disease. More was needed and there was no tomorrow for Alzheimer’s. Outstanding non-profits existed but I wanted to be aggressive with my mission of fund raising, awareness building and education, thus combining it with my climbing, I felt I could reach people otherwise missed or not having an outlet for their personal stories. In the 60 days I would take to climb Everest, 74,057 would be diagnosed with Alzheimer’s just in the US. The 7 Summits Climb for Alzheimer’s: Memories are everything was born with the support of Janssen AI and Pfizer. I made it to the top of Vinson in Antarctica and Aconcagua in South America and now was laying in a -20F sleeping bag at 26,400′ in gale force winds. My supporters had made it clear that safety was the top priority, however, I knew if I did not summit Everest, the underlying premise of my 7 Summits mission was damaged. After all who got the bronze medal in the 100 meter sprint in the last Olympics? As the winds dyed, I filled my thermos with hot water and turned on my batteries for my foot warmers. I put hand warmers in my gloves, pulled on my wool cap, positioned my goggles around my down hood and stepped out of the tent and onto the South Col. In the total darkness, the stars shown brightly in between the strong gusts. At this point we were a team of 14, 7 members and 7 Sherpas. With full down suits, oxygen bottles in every pack, headlamps on; we left the South Col at 9:20 PM on May 20. My heart pounded. I felt the pressure. I felt the strength. The comments on my website had been a source of continuous encouragement not only for the climb but more importantly for the cause. I felt the strength of a million legs. The climb from the South Col to the Balcony starts steep and continues. A fixed line was already in place set by a team of Sherpas a few weeks earlier. As the wind gusted I put my goggles on but the moisture from my oxygen mask created fog or condensation thus obscuring my views. Why didn’t I the small fan for my goggles? We started at a reasonable pace and I was shocked to find us, Kami and I, passing people who were standing in place with 1000 yard stares; not that I could see their eyes. I climbed steady putting every thought of my past experience out of my mind – but then embraced them as lessons and putting them in practice real time. I focused on my breathing – steady, not gasping. I was diligent with my foot placement taking advantage of every footprint in the soft snow. I practiced my mantra: 1 step, then a second, take a third; consider where I was and why; while taking a few extra breaths – and start over. The climb to the Balcony was long, longer than I remember. The winds had brought new snow up to our calves. Sometimes a step would take you lower, causing an involuntary gasp that comes with using big muscles in your leg. Our team was in the lead breaking trail. I followed Kami carefully knowing that perseverance and patience would pay off. And then we arrived at the Balcony, a snow covered flat spot the size of house living room. With headlamps aglow, it looked like something out of the movie Close Encounters. I looked at my watch – we had left at 9:20PM and it was now 1:00AM – 3:20 minutes! I had counted on 6 at a minimum. I told Kami and he just shrugged. Seems Sherpas have a different time system. Once again, the Sherpas went into action. Every climber needed a new bottle of supplemental oxygen. That required taking the current one out of the pack, unscrewing the regulator, putting it on the new bottle that a Sherpa had carried, testing it for leaks and putting it back in the pack. More than one climber had an issue with this process, not unique to IMG, not unusual with sub zero temps that caused the hard metal moving parts to freeze. But the Sherpas have centuries of collective experience with their 5, 10, 15 respective Everest summits so they know what to do. I took a drink while my bottle was being changed. I only had a moment to consider this was my personal altitude record – it felt good. I looked up at the South Summit, slightly illuminated by the half moon. It looked high, far way and very steep. I felt nervous. Could I really do this? One step, two then a third. The first section seemed doable, it was on fresh snow. 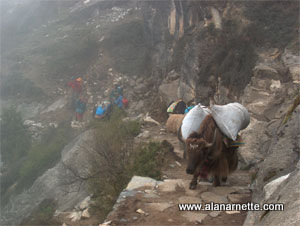 I kind of hoped that breaking trail would slow Minga, the Sherpa in the lead, down a bit; but that hope was in vain. I was now forth in our conga line behind Minga, Mirjam and Kami. How in the world did I end up in this spot? The route took a turn, not in direction but in slope, the steepness went from 20 to 40 degrees and continued. We continued at a steady pace. I looked around could see another 8000m mountain silhouetted to the East, Makalu. The other high Himalayan mountains looked like solders standing individually and proud. Stars shown brightly in the rarified air void of the contaminates of modern day life. But my momentary sightseeing came to a quick halt. As I climber higher, I knew there was a section know as the slabs below the South Summit, but honestly, I was not prepared for what I encountered. This section of maybe 300 feet was covered with smooth rock, sometimes in 10 to 30 feet uplifts. While there was a fixed rope the climbing required all my skills. The primary issue was the fogged goggles and the protruding oxygen mask, I could not see my feet or where to step. It was climbing blind, literally. I would watch Kami climb a section and try to put my feet where he did. But more generally, I would simply put my front crampon points on a small outcrop of rock and either push with my legs or pull with my arms to lift me to the next section. I was glad I was doing this in the dark, sometimes ignorance is bliss. The slab section came to an end but then I saw the South Summit and it required a climb on a relatively simple snow slope however the angle was now over 60 degrees and that is steep. One step, two then a third. Then I saw it. The true summit of Everest came into view for the first time since I saw it from Pumori a few weeks ago. I took a moment to let it sink in. And I knew I would make it. The first time in my life, I knew I would stand on the top of the world. The feeling permeated my body, I relaxed and took the cool oxygen deep into my hurting lungs. It felt good. I down climbed from the South Summit to a small flat section where we changed my oxygen bottle again. All part of the plan that allowed me to run at a slightly higher rate. Lesson from the past climbs coming to life now. But a change occurred, the winds went from breezy back to gale. I became very cold. My toes told me that something had changed. My body was cold since the early climb had generated a tiny amount of perspiration and my down suit did not breath that well so it was trapped and now conducting cold onto my core. I picked up the pace to generate some heat. The infamous Cornice Traverse came not sight. A short section of maybe 30 feet but at 2 feet wide with thousand foot drop-offs on both side, it is a feared section for many. I am not sure why but I simply walked across, glancing that deadly exposure without much thought. My thoughts might have been of the Hillary Step. Rumor had it that it was easier than normal with a lot snow making the crampon climbing easier. We came to the base of the Step and there was snow but also a lot of rock. Once again, I climbed blind, in the dark with only my headlamp showing the way. I was clipped into the fixed line and place my front points carefully. Oddly it took only a few moves and I overcame this feature. Once again, reality was easier than apprehension. But there was a surprise. At the top of the step we had to go left around a chair sized rock, not a big deal but it was on a ledge with another thousand foot drop to west (what would you expect on the highest mountain in the world?) A slip would be deadly so staying clipped in was critical. The final section came into view. I was expecting a nice gentle groomed blue ski slope but this was steep and somewhat narrow. But the big picture was incredible. The true summit remained hidden and the route followed the contours. However it was the wind blown cornices that caught my attention. These snow sculptures created by never-ending winds created an art gallery worthy of the Getty. Gentle curves that looked like cake icing swirled up and down as we gained altitude. A low glow was just appearing on the eastern horizon. We were the first on the planet to see this dawn. The winds were now gusting to 40 mph. It was cold, very cold. Then I saw them, prayer flags a bit higher and ahead. The summit Mount Everest. I looked at my feet, or actually a bit ahead. Now was not the time to trip. I forgot about the pain in my lungs, my sore legs, the wind, my insecurities. With one more step and I was standing on the summit of Mount Everest, 29,035 feet, 8850 meters. The summit was small, maybe 10 people could squeeze onto it. While we were the first four that day, three climbers from the North were already there. On yeah, there was another side to Everest! As the wind howled, my body core dropped. My toes and fingers went from cold to numb. I took out my satellite phone and called Cathy. This was our summit, she had worked as hard as I had; more in many ways. Next was a brief post to the Blog. I am not sure I could have held it together for anything too long. I dedicated this summit to my Mom, Ida Arnette, and to all the Alzheimer’s mom’s out there. After the calls, I heaved with emotion in the privacy of my down hood. With the wind howling, Kami took a few pictures of me and put away my camera; my only regret. He was ready to go and so was I as I became colder and colder. I looked around. Words or pictures cannot capture the scale of what I saw. In every direction were snow capped mountains, ice white glaciers, frozen rivers and stretches of flat expanses; all lit by the predawn sunrise. In spite of the winds, a moment of peacefulness filled me and I took my first steps away from the summit. Nine years to get here, 10 minutes to stay. While the ratio seems unfair, the memories will last forever. Retracing our steps, I down climbed the Hillary Step with no serious issues other than my oxygen mask freezing up cause a brief moment of panic when I simply told Kami, “I can’t breath”. A strong beating of the ice formation blocking the intake solved the problem. I honestly don’t remember crossing the Cornice Traverse with it’s deadly exposure. The climb back up the South Summit was straight forward but then we saw the crowds climbing up the slabs below the South Summit. It was like a Zombi movie with people climbing in slow motion or not at all, looking at the steep slabs in the light of day caused me to appreciate the cover of darkness. I was beat, between the pace, the wind, the cold the emotions; I was empty. I arrived at the South Col in 3 hours after leaving the summit. I collapsed in a tent, without taking off my boots feel into a deep sleep. Kami woke me up an hour later and we left for a very long down climb to Camp 2. I Iost the distinction between night and day, standing and walking, up and down; my body was on automatic, my mind numb. Now back in Base Camp, I am preparing for the three day walk to Lukla, the flight to Kathmandu and back home. It will be good to feel the embrace of my wife again. I am sure as I walk the trails of the Khumbu, the reality of this summit will set in. I will ponder the question of why this time was so different, so fast, why I stood on top of the world. I will think about how to reach more people with the cause, how to thank so many that took time to send me words, prayers and thoughts of encouragement. How to let people know that their belief in me made a difference. I want to bring into focus the need to educate people around the world about Alzheimer’s, how it destroys families and finances; and individuals. How we need more money for research, how we need that lucky break in the lab. Standing on top of the world was easy in comparison. But for now, there is reason to celebrate. Goals are meant to be pursued and obtained. Perservance can be motivating; however doing something for a larger meaning can make the difference between one step, then a second and a third. Congratulations Alan! We just found out that you stood on the summit of Mt Everest and read your dispatch – well done!!! You will have to return to the Bay Area and share your experiences, first hand, with us and others. And raise even more monies for the Cure Alzheimer’s Fund. Again, congratulations and well done! Thanks Bryan. I appreciate the good words and your generous donation. Congratulations! So glad you made it, 3rd time really is the charm – who knew?! This was beautifully written, you have a gift. Thank you for sharing your experience. Congratulations again and thank u for sharing this journey with all of us! Great job Allen your success great and your memories will live forever. You write as well as you climb, thank you for the inspiration. Incredible! Congratulations on your achievement. Your story of summiting Everest is riveting, and the pictures are great. You’ve inspired me with your reports from the expedition. Thank you! Just awesome to read Alan. Fantastic blog very detailed I felt like I was climbing it with you! brought a tear to my eye you are a huge inspiration after attempting it before and not giving in! Thanks from Manchester!! My class and I have been following your journey to the top of the world with our Flat Stanley. We are so excited for your success and safety. Congratulations. We look forward to reading more of the story. When you get home please take a nice rest and then send us back our Stanley so that ‘he’ can tell the story for you. We are so honored that you have shared your journey with us. Hi Joann, I am pleased to report that Flat Stanley is very safe after a successful climb with me to the top of the world! I will send you his summit picture in a moment. I will return him next week along with my signature on the back with the rest of the kids. Thanks for trusting me with him! Hi Karen and JIm H. Thanks! I hope my Mom is proud and not saying “OK, that’s enough” 🙂 Lori Schneider summited Everest a couple of years ago and she has MS – a great person and a real inspiration to me. So proud of the work you have done for this cause Alan, and what a fantastic climb! Turns out fourth time’s the charm eh? Can’t wait to hear of your other successes around the world now that the “big one” is finished! Great climb, great blog, and what an extrordinary picture. Happy trails to you and your team. What an amazing achievement Alan. Never give up on your dreams! I am following your cause right from the last year. I feel proud & get rejuvenated by the strength,dedication & courage shown by you in Climbing World’s topmost point for a great noble cause. I will not belittle you by giving thanks. Hearty congratualtion from another old man of 74 years in your endeavor & fulfilling your dream for a noble cause. Magnificent effort – inspirational. I am sure you Mum would be so proud of you. Congratulations on this great achievement. Following your mission over the past couple of years has been inspiring and I look forward to your continued adventures for this great cause. Congratulations! So glad to hear that finally luck was on your side and you made it to the summit. great climbing and excellent writing for a meaningful cause – but savour that personal accomplishment to – congratulations. A MASSIVE well done Alan, everyone knows how much this summit means to you, we are all very proud of you and I am sure your mum is looking down on you now with a big smile on her face. Well done and done well. Enjoy this victory! Thank you for everything that it took to achieve this incredible goal – dedication, determination, stregth of mind and spirit! With everyone applying the same focus to finding the answers to Alzheimer’s, hopefully someday soon we’ll be able to help people and families in their struggels with with this terrible disease. A heartfelt congratulations to you Alan. The warmth and honesty in your writing sets up apart from everyone else. Now rest up and enjoy your family. Alan, congrats on your successful summit! I’ve been following your climbing for years and am thrilled for you to have completed Everest. Thanks so much for sharing and for raising awareness about Alzheimer’s. Best of luck with your remaining climbs! Congratulations on your Everest summit, I am so proud of you and moved to tears when hearing your audio dispatch. Robert L. called me and we celebrated you. Then we realized that if you combine all the 14ers you have done, you have actually climbed Mt.Everest about 45 times. ; ) But this is the sweetest climb of all. Safe travels home! I have been following your coverage of the Everest climbing season for years, and I could not be happier for your accomplishment this year. Thank you for your coverage, it has allowed me to experience Everest in a way that would not otherwise be possible. Congratulations to you and your team. Have a safe trip home. Alan, well done. It feels like I climbed with you every step. Thank you very much for the app, for the fund raising and for achieving what some of us can only dream of. I`m so happy with your achievement. I waited every day for your messages, and BELIEVE ME, since the beginning I knew you would stand on top of the world. I also had a relative with Alzheimer in my family, and I do know what your cause is about. I hope you can continue helping people and families with the same problem. Alan, I have been following your Everest coverage for many years now, and your personal attempts to summit during an expedition. Congratulations on your achievement; I had a feeling this one would go well for you. It just seemed different from afar in the reports you had been writing. Well done! Fantastic Alan!! Many, many, congratulations. A well-deserved summit if ever there was, and a wonderful example of just what can be achieved through sheer perseverance and endeavour. A great post too, it captures that final journey to the summit so very well. Thanks for sharing all of those moments. Memories are indeed everything. Alan – I have been following your blog for some time now, and this is just fantastic. I shall be donating some money to your cause too. You are truly inspiring in every way – many many congratulations on all you are doing for Alzhemiers, and for reaching the roof of the world. Memories are indeed everything! Alan, u have bought awareness to so many about Alzheimer’s & I’ve shared what you’ve taught me, with so many & they too are now inspired to support this cause as a result. Know that it’s not you that need find a way to thank us, but us, that need to thank you for opening our awareness. You are a hero & a true example of the finest in human nature. Thank you from us all. Alan, u make us proud. U certainly had the support of a million legs behind u, but it was your determination for this important cause, that helped get you to that summit. I’m so proud of you & am priviledged to share your journey. I await with anticipation your next update & also your trip to Australia. You are an amazing human being. You have a great determination, what a fighting spirit. Enjoy the the trek back to Lukla and enjoy every second of it. PS. We had a swedish guy climbed with my business partner summited from the South side the day before you (Raul). Also, you might seen a blond Swedish girl named Annelie around the time you summited from the North side. Truly inspirational. Great achievement. I hope my daughter and I can experience this type of success next year on our climb. Well done again.